Blog-A-Book-Scene is a monthly themed blogging endeavor from a group of authors who love to share excerpts from their stories. Find us on Twitter with the hashtag #blogabookscene and #PrairieRosePubs. October's theme is Autumn and all things spooky. It's my favorite time of year! 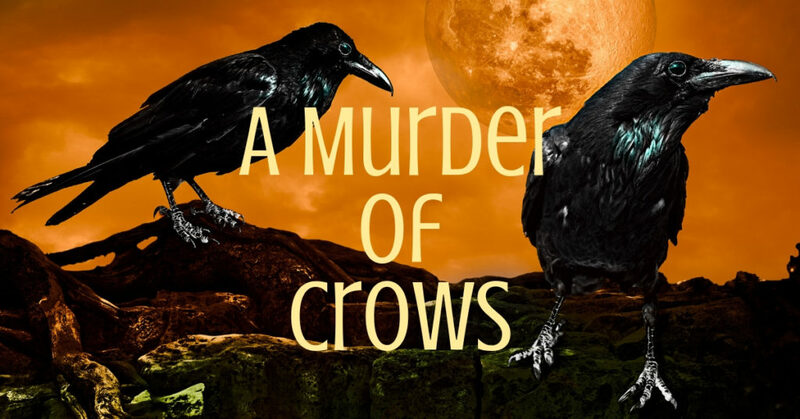 This excerpt is from my upcoming BRAND NEW release, A Murder of Crows. 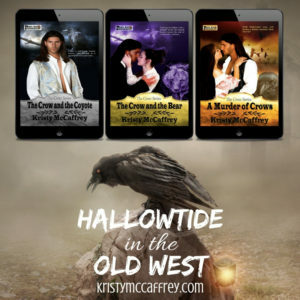 This is Book 3 in The Crow Series, a collection of spine-chilling stories set during Hallowtide in the Old West. I hope you enjoy Kester and Eliza's supernatural adventure into a place called The Hallow, while trying to deny their growing attraction to one another. Bounty hunter Kester “Kit” Boggs, along with his brothers, tracks and destroys the vilest of men, both from this world and the next. With a Scottish and Comanche lineage, his connection to the supernatural is tied directly to the crow. For too long, he’s been hunting El Viejo del Saco, a demon known as The Bag Man who feeds on the blood of children. A rumor leads Kit to the Mexican frontier, where he must find a man called Hamish Kerr. But with Hallowtide descending, Kit has lost his ability to hear spirits, and his only hope is a woman whose family is a sworn enemy to the Boggs’ clan. Eliza McCulloch’s ancestors hail from Scotland, her clan carrying an ancient curse and a warning—a McCulloch may never bind herself to a Boggs. When Eliza learns that Hamish Kerr stole her family’s book of spells, the McCulloch Grimoire, nearly two decades ago, she sets out to reclaim it. Often called witch, she possesses a unique skill to open doorways to the other side. But when she finds herself beholden to a Boggs for protection, her abilities take an unexpected turn. As Kit and Eliza unearth far more than a stolen book, they must work together if they are to survive. But with the past pushing into their future, can they resist the growing desire between them? Is it possible for a Boggs and a McCulloch to find lasting love? Or will defeating the demon separate them forever? Available this Thursday (October 11) at Amazon and Kindle Unlimited. “There are more of you?” Eliza asked. “Why would you get into bed with a Boggs?” He immediately regretted his choice of words, not only from the withering look Eliza cast upon him, but also because bedding her was a desire that had taken residence in his head, and he doubted it would leave anytime soon. A Boggs is never to touch a McCulloch. Kit set his jaw. It was definitely Granny in his ear. Hell of a time for her suddenly to confide in him. He bristled at the smug authority in her tone, transporting him back to his boyhood when Granny’s exasperation with him inevitably led to a rant. “I’m not offering you my body, Crow,” Eliza said, an edge to her words. Leaning back in the chair, Kit stretched out his legs and crossed them at the ankle. He almost laughed. This whole thing was going south, and fast. As much as he’d like to help the pretty McCulloch, she had no business going anywhere near Hamish. Eliza arched an eyebrow. “Let me get this straight. You tell me I’m incapable of handling this myself, but when I ask for your help, you say no.” She shook her head, her look dismissive. “Then I will leave.” She stood. How wrong she was on the first count, but he didn’t voice it aloud. It would seem he wasn’t about to be free of the McCulloch siren after all. And despite the danger, a traitorous part of him was glad for it. Kit brought his hand to her dark hair and lifted the strands spilling over her shoulder. The awareness between them was palpable. It pleased him that she didn’t pull away. He didn’t bother to hide his grin, which soon turned into a full-on laugh. Don't miss all the spooky and romantic tales in the series. 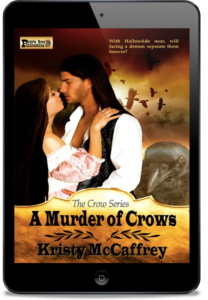 join Kristy's Newsletter. Get 2 free exclusive novellas! Please check this box to confirm that you agree to receive email and relevant, targeted marketing from Kristy M​​​​cCaffrey.